Among the three hundred known species of tarantula inhabiting our earth, the Goliath Bird Eating tarantula spider is the biggest of them all. Its leg span is ten inches and it weighs more than six ounces. Like other arachnids, these also possess eight legs, enclosed in dark brown hair that become nearly white at each of the joints. The Goliath bird-eating tarantula has two attachments in the neighborhood of its fangs that look like its legs, which they are not. In fact, these attachments, called pedipalps, are their sensing organs that help pushing down the food to spider’s mouth. Like other tarantulas, the mouth of the Goliath comprises of jaws, which move up and down, quite unlike the side-to-side movement in case of other spiders. Reddish hairs cover its head and abdomen, giving it a golden blond look. It is because of this color that they call this spider also as blondi, the Latin equivalent of golden. Like most arachnids, the bird eating tarantula’ body consists of two parts, the prosoma or the cephalothorax and the abdomen or the opisthosoma. A pedicle or a pregenital somite connects these two parts. Despite its eight minute eyes, the Goliath has a poor eyesight, just enough to allow it to distinguish between light and dark, making it rather difficult for it at the time of mating. The diet of bird eating tarantula comprises of beetles, small snakes, lizards, frogs and bats. These spiders are in the habit of taking away young birds from their nests, and hence the name “bird eater." The spider creeps onto its prey and seizes it, injecting it with venom, released through its fangs. The Goliath inhabits coastal rainforest of South America and Surinam, Guyana, and French Guiana. This spider has many enemies, the most dangerous being wasps, known as the Pepsis or the tarantula hawk. The wasp paralyzes the Goliath and hauls it back to its nest. 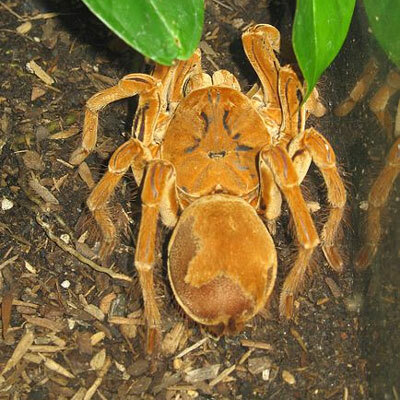 The Goliath Bird Eating tarantula spider is a spider of the night and lives in deep hideaway. They do not prepare their own hideaway but live in hideaway abandoned by rodents or small animals. This variety of spiders do not fashion partnerships and befriend other adult spiders only for mating. The Goliath is very hostile and has built-in defense mechanisms for safeguarding it. On sensing danger, the Goliath creates a loud hissing noise by rubbing together the bristles on its legs. It can also obscure the attacker by pushing its hairs at the attacker. The pointed hairs cause extreme pain and irritation. 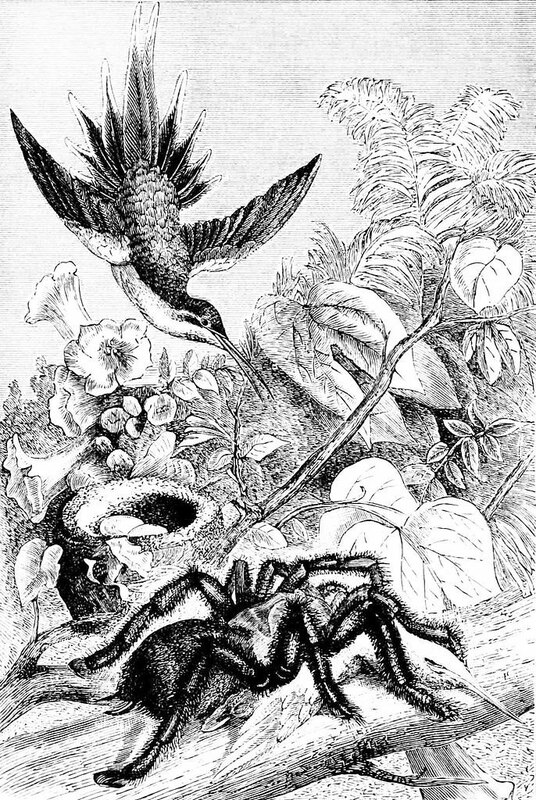 With the early advent of spring or early summer, the male bird-eating tarantula lures the female from the depths of the burrow to the entrance, to mate. After an interval of several days, the female lays her eggs in a silk woven sack with a diameter of about 30 millimeters. She spins a thick layer of silk, and protects her eggs in the burrow. Surprisingly, she always carries the sack with her when she goes hunting outside the burrow. After a period of about two to three months, the eggs hatch more than 100 spiderlings. These little ones stay in the mother’s burrow for hardly a few weeks before they move out to find independent burrows of their own.